Hey Coffeeholics! It’s nearly Christmas na! Tomorrow will be December 1. Have you done your Christmas shopping? Or rather when do you do your Christmas shopping? In advance or whenever you have the free time or budget? I know the feeling. With Christmas nearing, you have to juggle your time and budget for your Christmas shopping. Well here’s a tip for you, have you tried buying online instead? Buying online has never been so much easier now in this age! All the information and things that you need are all just a type away! You don’t have to go out physically and look at each store for each item on your shopping list. You don’t need to be stuck in traffic or go through the hardship of commuting just to go to the mall or Divisoria to buy stuff. All you need is your computer or smartphone and the internet! Its super fast and convenient? Amazing right? Well I've got good news for all of you who are part of the war against acne! Yes, Proactiv understands your needs. Here are the reasons why you should order your Proactiv packages online. 1. It is easy. Just create an account and you get to have access to Proactiv products (kits, product extensions, and exclusive online promotions). Yay for promos and deals! 2. No need to leave your house or office. The Proactiv kit will be delivered straight to you at NO DELIVERY CHARGE*. 3. You can order anytime, 24/7. No need to worry if you’re working on shift and all the malls are closed during your free time to shop. hotline at 02 729-2222 (Metro Manila), 1-800-10-889-4444 (PLDT Provincial), 1- 800-8-7298888 (Globe Provincial). 5. Overnight delivery is available in most key areas. Their delivery partner is Aboitiz2Go and there might be some lead time considerations for provincial, non-covered areas, or holidays. 6. Cash on Delivery is accepted. 7. Credit card payment is accepted. We have secure servers, data-encrypted payment portal. Nobody sees your confidential details. 8. Money back guarantee! If you are not happy with your purchase, send it back to them and you will get a refund. 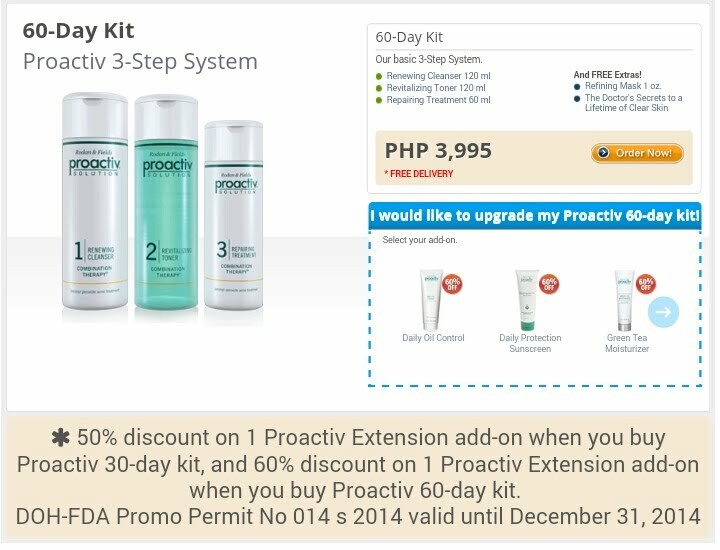 Please visit http://my.proactiv.com.ph/guarantee.htm for more details. 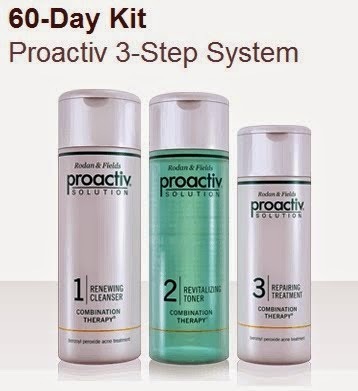 If you want to to check out what Proactiv products are available for purchase, do visit https://my.proactiv.com.ph. But just in case you need a list, here are the products that you might want to buy at their website. 1. 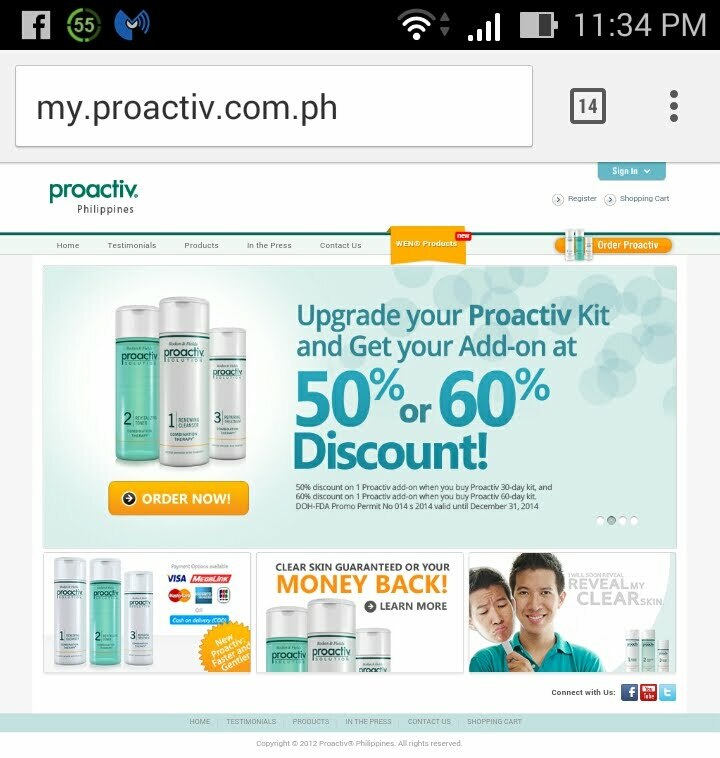 Visit: http://my.proactiv.com.ph and create an account. Depending on your browser, the link may not work with www at the beginning so please take note of this URL format and use it as is. 2. Once you have an account you may browse Proactiv products at the website. Select products, fill your shopping cart and check-out. You may fill out the delivery instructions and special notes to the rider on this section. 3. Finalize your purchase. The shopping cart accepts payment using Credit Card or C.O.D. (Cash on delivery). 4. Check your email. Transaction details will be emailed to you. For those wondering if the Free Delivery apply to online purchase of non-kits? The purchase of product extensions along with a 30 or 60 day kit delivery is FREE of charge. Orders are processed and shipped daily during regular business days. this cutoff time are processed on the next business day. Online shopping can definitely give you extra time for this Christmas. Be effective, resourceful, and efficient this Christmas. Go online and take advantage of this feature by Proactiv today. 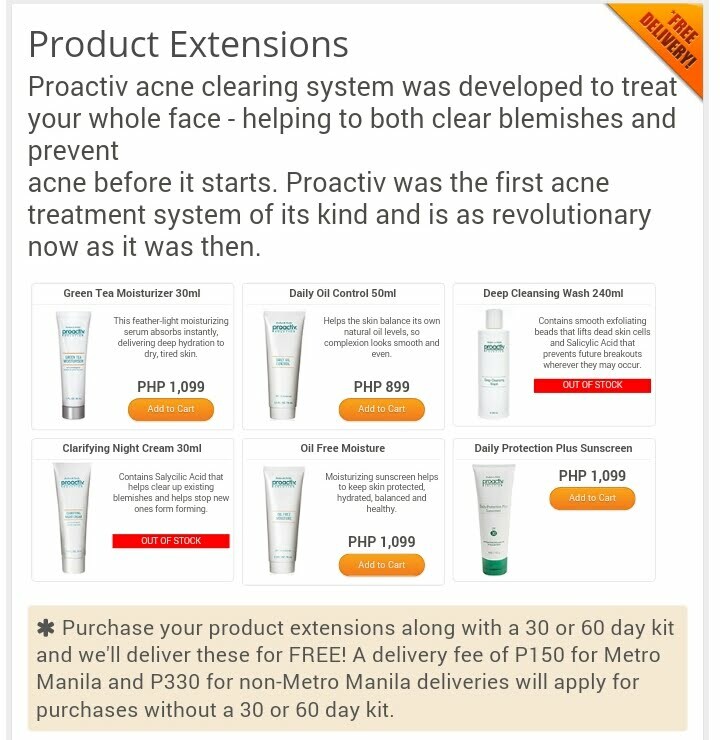 If you are ready to order, then click this link to go to directly to their site - http://my.proactiv.com.ph/getproactiv.htm?afc=Pro1412KA Happy shopping!